And if you are smarter than me you will wear gloves while handling the jalapenos to prevent 3 hours of burning fingers. I also recommend removing as many seeds as you can because that is where most of the heat comes from. The tomatoes and peppers are grilled in this recipe (hence the name) but I think you could get the same effect by broiling them. Just keep an eye on them so they don't turn into charcoal. You want them charred but not brickettes. And as for the liquid smoke, if you're not going to add it ... well don't bother making the salsa. 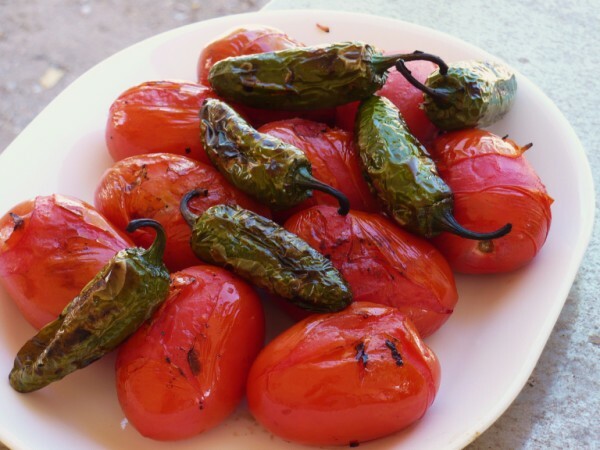 Once the tomatoes and peppers are cool, remove the skin from the tomatoes and place them in a food processor. * Pull off the stem of the peppers, remove any burned skin and seeds, and add to the food processor. Add remaining ingredients to food processor and pulse until mixture is smooth. 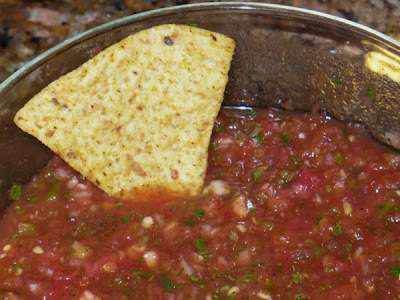 Pour salsa into a medium size bowl, cover, and chill for several hours or overnight for best flavor. *If you don't have a food processor, this can be made in a blender: pulse for 1-2 second intervals and use a rubber spatula to stir it up until you can get it all the same consistency.